Krefft, 1868, Ann. Mag. Nat. Hist., Ser. 4, 2: 296. Trans. Linn. Soc. London 9: 174. 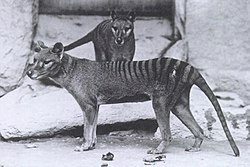 Thylacinus cynocephalus in Mammal Species of the World. For more multimedia, look at Thylacinus cynocephalus on Wikimedia Commons. This page was last edited on 28 February 2019, at 02:21.